With such a wide range of styles to choose from, there is a plain or pattern bow tie for every occasion here at Mrs Bow Tie. 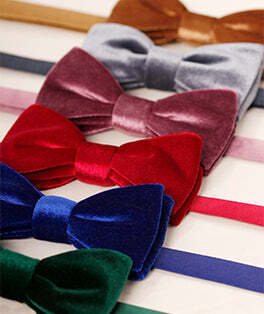 We offer many different styles, from stripes and spots to quirky bow ties. Complement your outfit with any one of these stylish bow ties, whether it be for a formal event, informal gathering, or a wedding. Abstracts, geometrics, and paisley are all great patterns to help you bring a mixture of colours into your outfit and create a statement look. Not only can you choose from a whole host of patterns, but almost all our bow ties are available in multiple shapes, from skinny ready-tied to diamond point self-tie. There aren’t any rules for which shape of bow tie you should wear, it’s down to personal preference. With thousands to choose from, it doesn’t matter whether you need classic plain coloured, floral or tartan, you can find these all in one place with our extensive range.